Sister Rose Immaculate Waller, O.S.F. 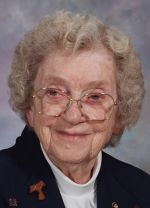 Sister Rose Immaculate Waller, 93, died Oct. 21 in Assisi House, Aston. She had been a professed member of the Sisters of St. Francis of Philadelphia for 71 years. Sister Rose Immaculate (nee Winifred Waller) was born in Media where she was a member of Nativity B.V.M. Parish and a graduate of Notre Dame High School, Moylan. She entered the congregation in 1940 and professed her first vows in 1943. Sister Rose earned a B.S. in education and an M.S. in library science, both from Villanova University. She ministered primarily in education as a teacher and librarian. Sister Rose ministered in schools of the Archdiocese of Philadelphia for 55 years. She taught at St. Benedict, St. Alphonsus, St. Bonaventure and Our Lady of Consolation in Philadelphia, and St. Stanislaus in Lansdale and Resurrection in Chester. She also ministered for a number of years as a librarian at St. Stanislaus, Lansdale Catholic High School and Neumann University in Aston. After her retirement she continued living at Our Lady of Angels Convent and decided to develop an earlier interest in photography. She entered her nature photos in various art shows and received a number of awards. Her work has been exhibited in the Media Art Shows, Rose Tree Park and Daylesford Abbey. She also has photos on permanent display at Neumann University, Our Lady of Angels Convent, St. Mary of the Lakes School in New Jersey, Assisi House and Riddle Memorial Hospital. In 2014 she moved to Assisi House and served in prayer ministry until her death. During her 10 years of ministry in the Diocese of Allentown, Sister Rose taught at Sacred Heart School in Allentown. Additional ministry experience includes teaching at Nativity School in Washington, D.C.
All services will be held in Assisi House, 610 Red Hill Road in Aston, on Friday, Oct. 24. A Christian Wake Service will be held at 9:30 a.m. followed by a viewing. The funeral Mass will be at 11 a.m. Burial will be in Our Lady of Angels Cemetery in Aston. Sister Rose Immaculate is survived by cousins and by her Franciscan family. Donations in her name can be made to the Sisters of St. Francis Foundation, 609 S. Convent Road, Aston, PA 19014.